Thread: Calling all Heuer BUND 'fly-back' experts! 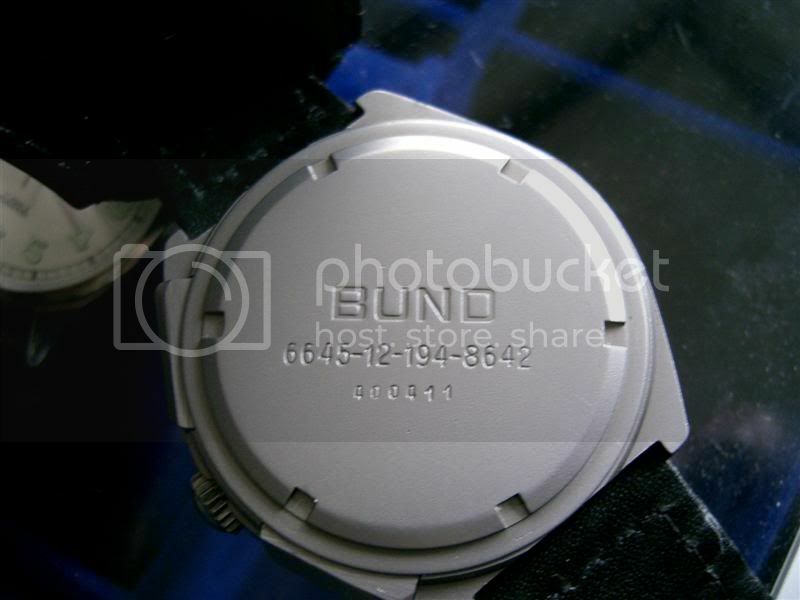 I've been hunting for a Heuer BUND and come across a couple of dial variations which I'm having difficultly verifying. I'm not claiming to be an expert, but based on advice from a few friends here, and other resources on the internet, I'm beginning to wonder whether there is a market in 'reproduction' dials for this watch. 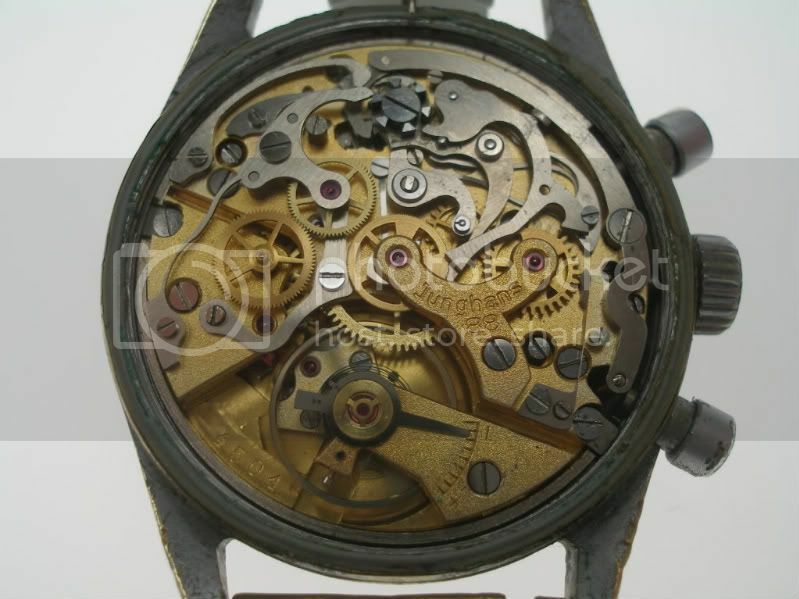 This is not just speculation because one seller has specifically stated that one of the dials (below) is not new, but original. I'm also becoming sceptical about how many examples are up for sale with seemingly new hand sets. Now I doubt there are significant stores of original Heuer BUND hands anywhere anymore. Not to say that its not possible to source the identical hand set as new (given the ubiquity of this style hand set in other watch models) but I'm interested to know more about this. Here are a couple of shots of two dial variations. I won't add my concerns, but rather just invite any thoughts that you may have, given the wealth of experience and knowledge on this forum. Thanks, and I look forward to any comments. Al' is quite the expert on these. The 3H on these two is different to mine but there are variations. There used to be a definitive post on the net about these Heuers but it has disappeared. You should find quite a lot about them on NSN if you search. Fashion has dictated that the "3H, small T" dial is the one to have and they not only sell for more but also sell more quickly than the other versions, so I wouldn't be surprised if someone was adding the desirable red 3H. I have also had my suspicions about some of the dials appearing for a while now. I did look into all that some time ago and the thread is here on NSN if you search, as I mentioned above. Personally, I wouldn't bother with either of those two if you are not sure - there are enough around to wait for one you are sure about. Let me guess, is the bottom one for sale in Australia? 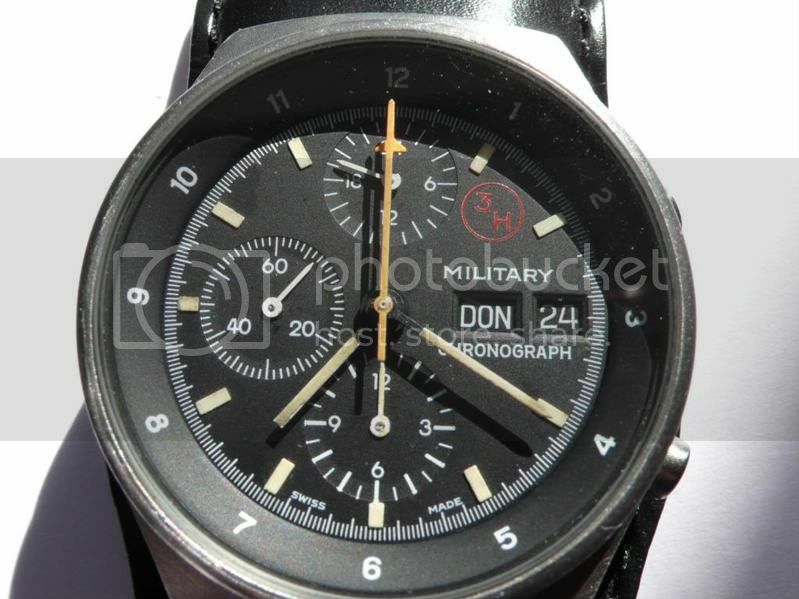 I'm still surprised about their relatively modest prices - they must be the most iconic military watch ever made judging by the fact that one appears on the cover of just about every book on the subject! If you want a really good example, why not speak to Al'? ...The 3H on these two is different to mine but there are variations. There used to be a definitive post on the net about these Heuers but it has disappeared. There is a comparison by Manning, here (but, of course, it may not be 100% complete. In his PD-Orfina BUND article, for e.g., there are some holes). Having said that, the 3H in the photos (above) is not present in his comparison and I'm with you in thinking they are dubious. Let me guess, is the bottom one for sale in Australia? ...and the top one is here in Frankfurt. I too have noticed and wondered about the relative large number of NOS Heuer BUND's that have emerged over the last three years or so. 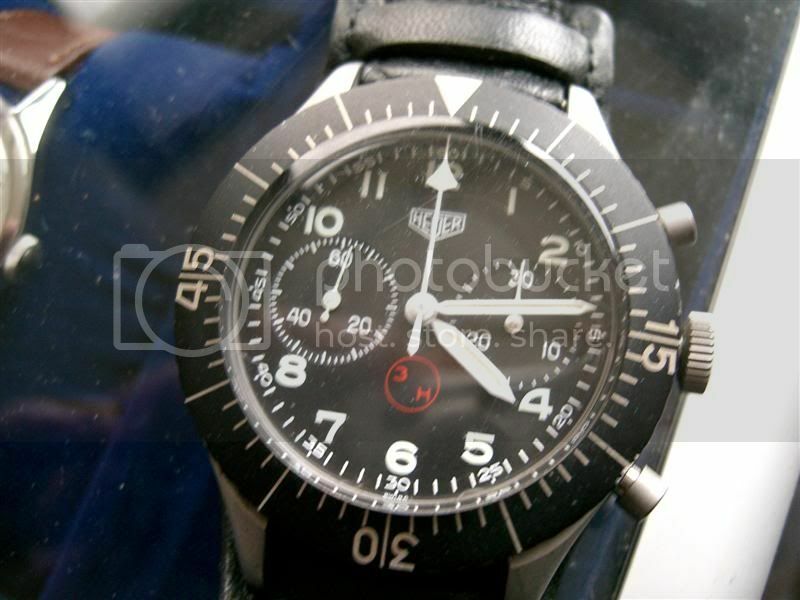 I bought my Heuer back in 2007 and do not recall that ebay was floating with NOS Heuer's. 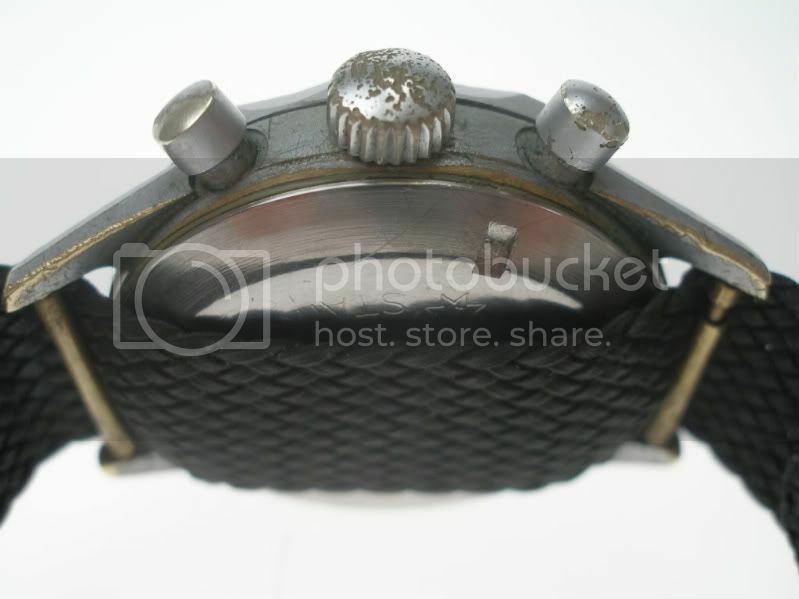 However about the Heuer spares, I was in 2007 told that Helmut Sinn had a quite large stock of hands gaskets etc. This doesn't seem to be the case anymore, and these spares might have gone to Australia? the seller in question was previously very active and helpfull on MWR, and I have always regarded his BUND as "100% legit" but with NOS spare parts. This is after all a part of military watch history that worn parts are exchanged during service, so I do not see the use of NOS parts as a big problem. It is of course another matter if the 3H is added later. 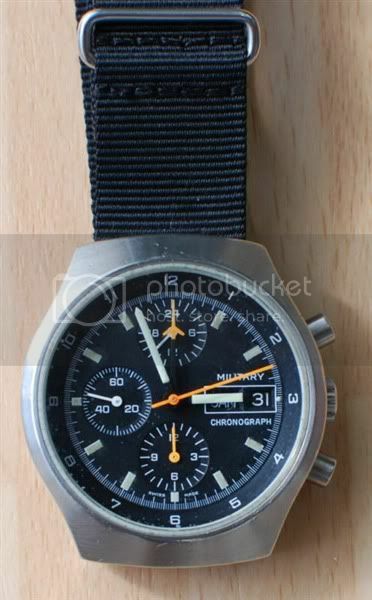 My own Heuer is far from NOS, and is a "genuine put together" of parts from a long active life with the original owner from the Germany airforce; lumen on hands does not match dial etc. I also own a Orfina Black BUND and would like to hear what you could add to the info from Manning. Junghans, with the J88 movement. In my oppinion the most sought after! The watch was also issued to the commanding officers of the Navy, especially the commanders of the submarines and the fast patrol boats and to the commanders of the armoured reconnaissance/ long range reconnaissance patrols of the Army as well. 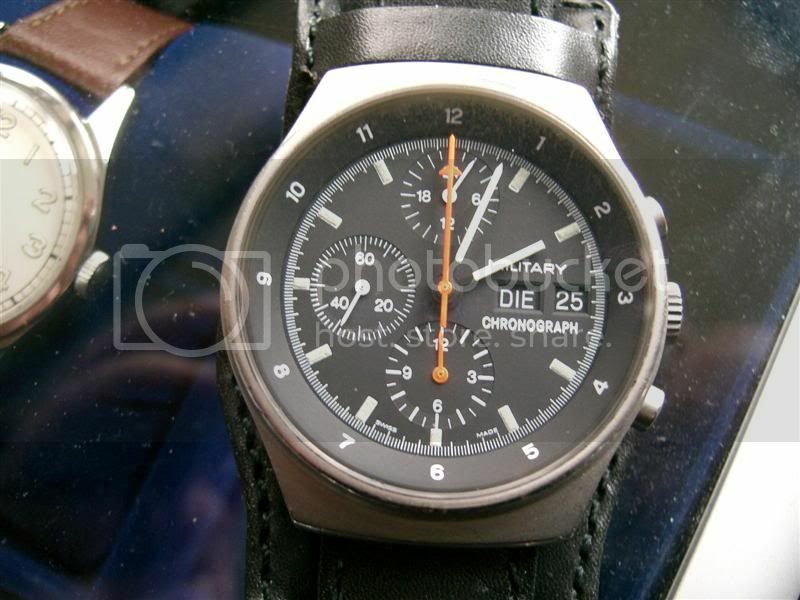 The Heuer H3 was the watch which took over after the Junghans. 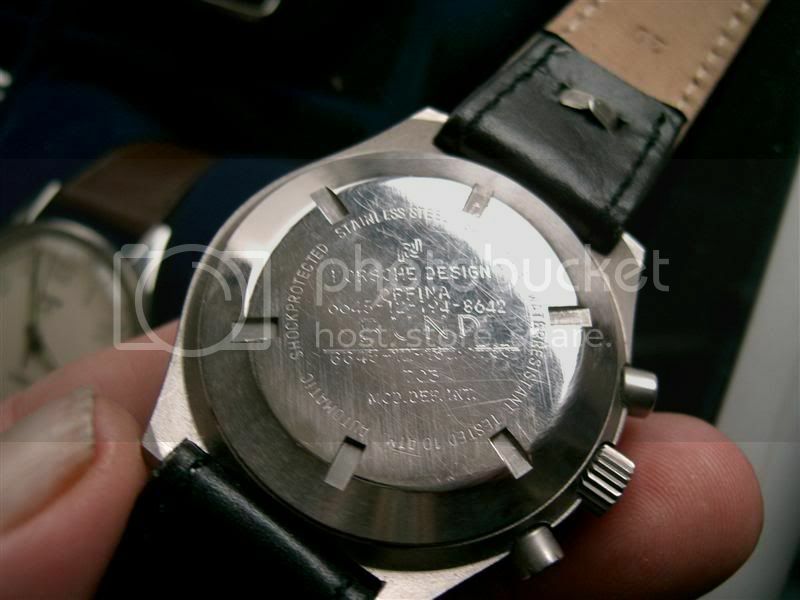 Orfina Porsche design Bund, Lemania 5100 Workhorse movement. 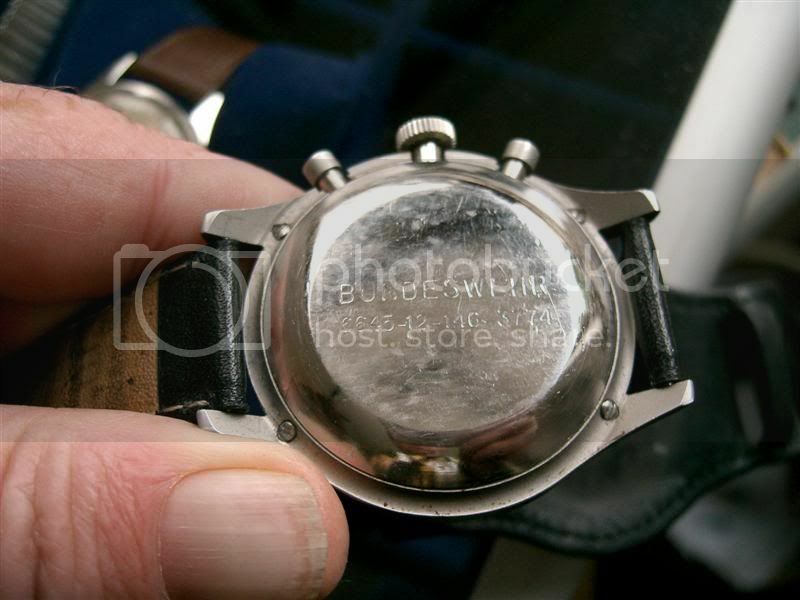 Here with the same movement, Lemania 5100, the Arctos Bund. They all look very much alike, that´s because the Bundeswehr had stringent specifications which they had to be made made to. Oh no. I've been busy for a few days and during that time it looks like this thread has turned into a photo album thread rather than its original intention. Oh well, I'll try and get things back on track later today. Yes, this is part of the reason for my starting this thread. It seems to me, and perhaps it is something I misperceive, but there have been quite a few BUNDs come up for sale recently with something like NOS parts (i.e. crystal, hand set, bezel). I suppose I'm sceptical because there are almost no examples on the market that have not be refurbished (and also that it is a recent phenomenon). 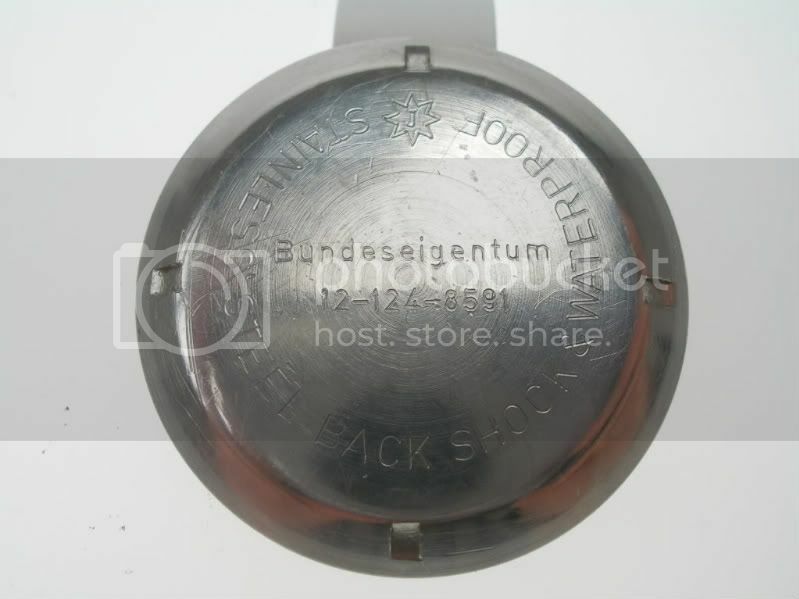 I have evidence of several dealers (in Germany at least) that claim to have taken over or purchased stocks of parts from watchmakers with previous Bundeswehr contracts. This may well be the case, but I also have some doubts. The seller in question was previously very active and helpfull on MWR, and I have always regarded his BUND as "100% legit" but with NOS spare parts. This is after all a part of military watch history that worn parts are exchanged during service, so I do not see the use of NOS parts as a big problem. The question is about 'NOS' vs. 'reproduction' spare parts. Now maybe I'm making an issue where there is none, but for me, there is a big problem if someone somewhere is making 'reproduction' parts rather than tapping whatever NOS may exist. I'm not sure what to think about all this. I have it on good authority that Helmut Sinn himself has little or no stash of parts (and from what I've heard he wouldn't sell them to the kind of guys who claim to have NOS parts). Guinand may have a supply but if its NOS or 'reproduction' I don't know. The Sinn factory may also have some parts. However, I'm still sceptical about some of the dials I've seen. I don't think they're fake, just that they're not NOS and may have been produced more recently. I'm not so concerned about 'authenticity' because I think there are very few (perhaps no) unmolested pieces out there. However, I'm suspicious that there has been made available in the past year or two a lot very good condition dials. People will have different feelings about this. For me it dilutes the quality of the BUND. Also, why should prices for refurbished examples be higher than unmolested examples. For me it should be reversed. 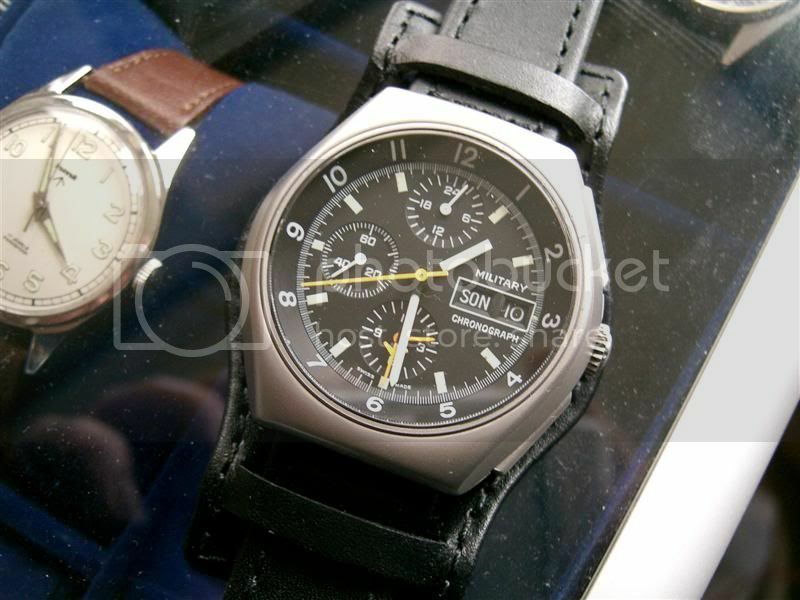 I don't see any old Hanharts or Junghans BUNDs endlessing poping up for sale with pristine 'replacement' parts. There are differences between these watches and the Heuer BUND but again, for me, it just raises a question, and that's why I'd like to hear what other people think about it. It is of course another matter if the 3H is added later. 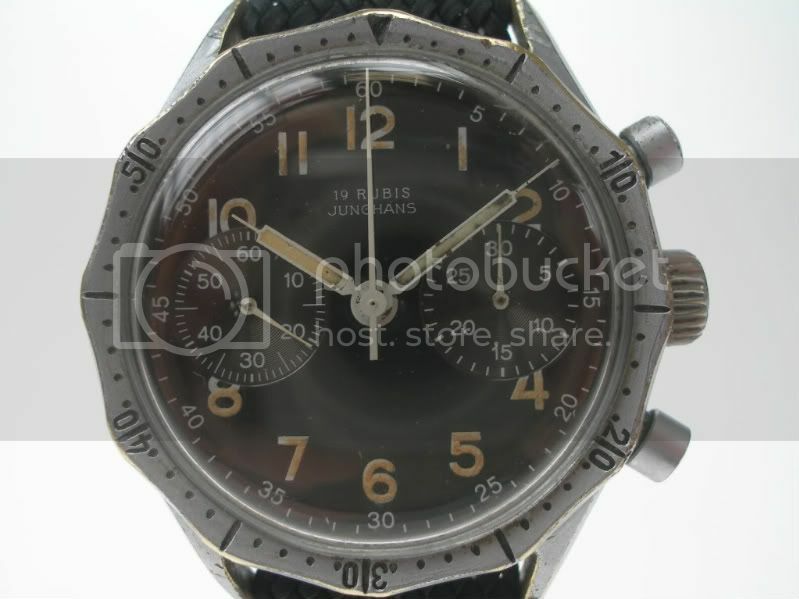 From what I've seen recently (again this is just my own experience having seen and handled quite a few) I really doubt that there are many Heuer's out there with a 3H added to an original dial which was previously sterile. My guess is this is an online watch forum myth. It is far more likely either that someone has a huge supply of NOS dials, OR someone is still making dials. The strange versions of the 3H that pop up may be accounted for in this way. I think this may also explain why there are so many 3H versions for sale, and far fewer sterile versions, i.e. a contemporary supply of dials with the 3H (= instant seller premium). Of course, there may be been fewer sterile versions issued to begin with. Mate... if only. If they are underrated then they are not unloved because they are hard to find. On the PD-Orfina have a look at the following thread where we discussed this a bit. Look in particular at Pascal's comments which are an excellent summary of the variants. It think the Manning article is even more problematic when it comes to the Heuer. I have seen so many combinations of dials and case-backs that do not appear in his summary that it seems obvious to me that you need to do a LOT more than simply regard it as definitive. The problem is that article is endlessly posted on forums and rather than providing a complete guide to Heuer BUND variants, it actually creates a 'new truth'. These things can and should always be disrupted by new information. I don't know what effort or tools it takes to make "reproduction" spares, but if it is done it is not acceptable too me as well. On the other hand we are not just talking about hands and dials on the NOS I have seen; bezels cases pushers and movement also looked to be in pristine condition. 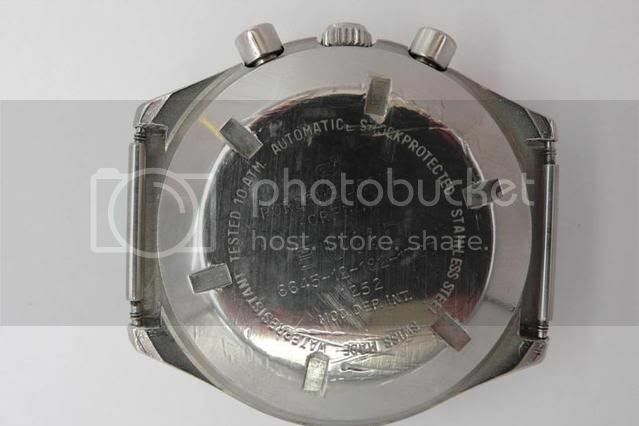 I don't know if there are ways to verify the age of the dial and hands we are seeing (and more knowledgeable watch-geeks/makers have to correct me here) but tritium isn't available anymore and the lumen on the dials we are discussing looked aged. Either they aren't tritium (then reproductions) or they are NOS. 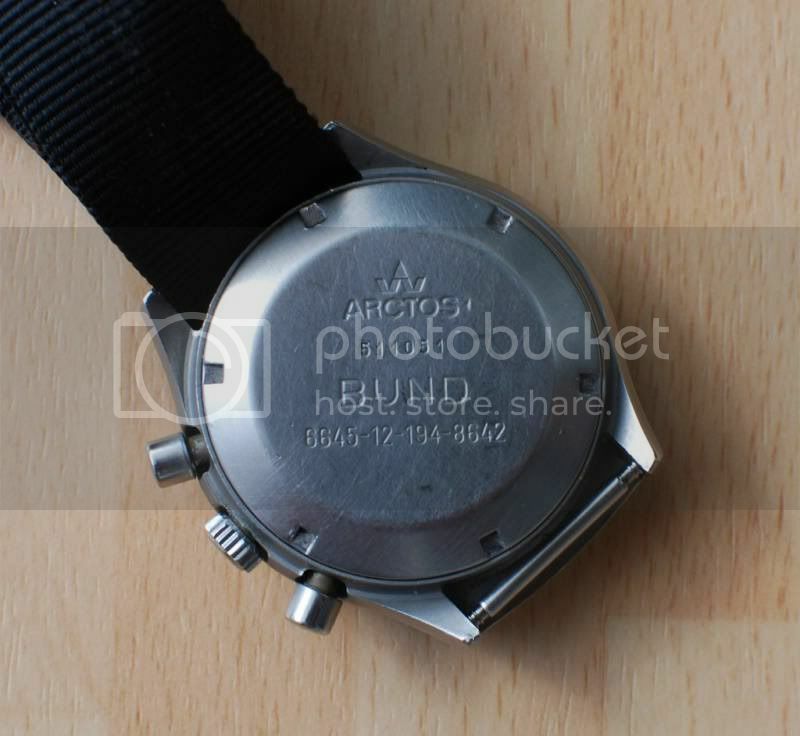 Back in 2007 the Heuer spares was for sale directly on the Sinn website, and anybody could place an order. This is not the case anymore why I assume Sinns stock is gone. While reading and writing about these NOS Heuers I'm trying to estimate how many NOS I actually have seen "popping up". Is it 20 is it 30? It maybe seems a lot because we constantly are watching the market, but compared to the total number it is a very small fraction. If someone found a box of NOS Heuers and decided to sell them one by one, our observations would be the same. Exactly that seems to have happened with 24 Leonidas some months ago, where they all at the same time appeared on the same website! Good thread, don't know how I could miss that in the first place. I fully share the views of Pascal but as the current owner of "Al's all black to nice to be worn" Orfina, I would like to hear if any consensus was agreed on the "by Orfina" marked dials?